Just like humans, animals can be affected by infectious diseases, some of which can be transferred to humans. As responsible pet owners that want to keep your animals safe and healthy, we highly recommend that you vaccinate them in line with current guidelines as established by the American Animal Hospital Association (AAHA). Most puppies and kittens receive some initial protection against infectious diseases from their mother’s milk as long as she has been regularly vaccinated. However, this protection only lasts for a few weeks to months and so your new addition will need to be vaccinated from an early age. Many puppies or kittens will go to their new homes having already received their first vaccinations but check with their former owner before you bring them home. If they have not yet been vaccinated, we recommend that get their first vaccinations done as soon as possible after taking ownership of them. Puppies and kittens should be vaccinated starting at 8 weeks, and given booster vaccinations every 3-4 weeks until they reach a minimum of 16 weeks of age. Booster injections should then be given 12 months from the initial vaccinations. After that visit, we generally follow the vaccine guidelines established by the American Animal Hospital Association and the American Association of Feline Practitioners (AAFP). Rabies vaccination is required by law due to its potential for being spread to humans. Rabies is deadly, and there is no cure. It is spread through saliva and bites from an infected animal. All mammals are susceptible. The virus affects the central nervous system, so symptoms range from general weakness to paralysis, seizures, aggression, and excessive salivation. Spread by bodily fluid contact, there is no specific treatment and dogs with severe symptoms often die. Those who survive commonly have neurological difficulties later in life. Symptoms include fever, coughing, diarrhea, and vomiting. Spread by contact with feces from infected dogs, it mainly affects puppies, but can also be seen in dogs that have not had regular booster vaccinations. Symptoms include vomiting and diarrhea and dehydration. Without treatment, 80% of dogs with parvovirus will die. Treatment has approximately an 85% success rate. Commonly known as a kennel cough. Spreads via dog to dog contact, airborne contact or contamination of the living environment. A bacteria-based disease usually spread by infected water. It causes fever, lethargy, vomiting, bloody diarrhea and jaundice in your pet. Severe infections can cause organ failure and death. It can be treated with antibiotics but the bacteria can be carried for months afterward and their urine will remain a health hazard to both other animals and humans. Leptospirosis in humans can be fatal. A viral disease that is spread by respiratory droplets that can spread up to 20 feet from a single cough. Direct contact with other dogs is not required to spread the disease and it spreads very easily between dogs. It can cause fever, lethargy, coughing, sneezing, nasal discharge, and can lead to pneumonia in some cases, especially in the very young, very old, or immune compromised. Central Florida was hit with a significant epidemic of Canine Influenza H3N2 in the summer of 2017. This is a virus that affects and is in the parvovirus family but is often referred to as feline distemper. Its symptoms include vomiting, diarrhea, lethargy, and fever. Spreads via cat to cat contact, airborne contact or contamination of the living environment. One of two viruses that cause upper respiratory infections. Its symptoms include sneezing, fever, discharge from the nose and eyes, and mouth ulcers. Spreads via cat to cat contact, airborne contact or contamination of the living environment. Vaccination prevents some strains but not all. Spread by the saliva or discharge from the nose and eyes in infected cats, it can also survive in its environment. Like feline calicivirus, it is a type of upper respiratory infection, as its symptoms include fever, sneezing, conjunctivitis, and discharge from the eyes. Once a cat has had feline herpes it is infected for life and may suffer recurrent flare-ups that are treated with anti-virals, amino acids, and eye drops. 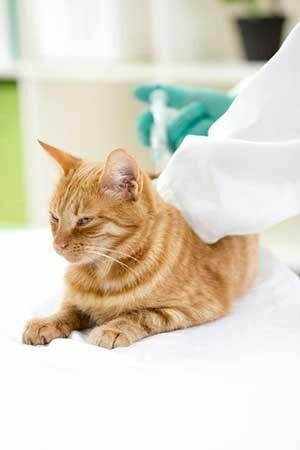 Newer guidelines recommend that most cats should also be vaccinated against feline leukemia virus over their lifetime at varying points depending on their level of risk. This disease is thought to require very close contact with infected cats to be spread, such as milk from mother to kitten, or bite wounds. It is much more common in city areas, and among un-neutered and stray cats. Multi-cat households also present a higher risk. The symptoms include poor body condition and coat, anorexia, diarrhea, and jaundice. The virus attacks the bone marrow which results in leukemia and sometimes lymphoma.